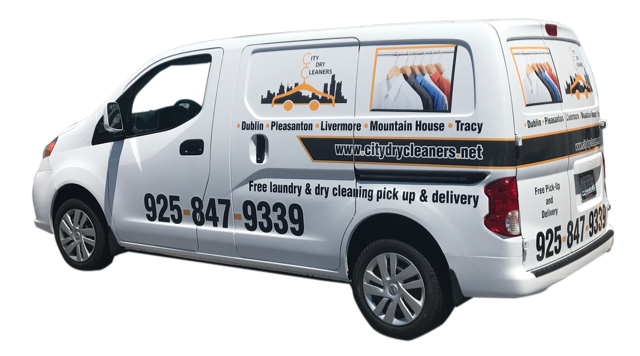 City Dry Cleaners has No Start-up or Hidden Fees! No Contracts! And No Obligations! Hard to believe? I promise it’s true. Here is how the service works . . .
To get started, you can place dry cleaning orders online, track items, and seamlessly pay using our website or our app. When we receive and return your first order, you’ll receive our FREE Custom Garment Bag to KEEP for your dirty clothes. Our driver will pick up and drop off your items from your home or office on specified days based on the service area. For example, Pick-Up (MONDAYS) Drop-Off (THURSDAYS) or Pick-Up (TUESDAYS) Drop-off (FRIDAYS). Don’t worry, if you don’t have cleaning every week, it’s no problem. Need it back sooner? Just ask and we’ll make it happen. At the end of each week, we will bill your credit card for the services you had for that week and we email the statement or attach a printed invoice for your drop-off order, based on your preference of receipt. Please Note: - We are closed most major holidays: New Year, July 4th, Thanksgiving Day and Christmas. When a major holiday falls on a scheduled delivery day, Pickup or Delivery will be made on the next scheduled delivery day after the holiday.